This is what I call a HK movie which have a story and what a story it was! This is it. The film that single handedly gave birth to the new wave genre which dominated Hong Kong cinema in the early 90's. And you Know what? It's not hard to see why. And I love every single second of it. But it hasn't always been that way. When I first watched it, I was a little bit disappointed. But I'll explain that later. The story follows Wong as he battles ruthless imperialist forces determined to subjugate his country and enslave his people with a terrifying new weapon. the gun. At least that's what it says on the tin. The movie is much more than that! 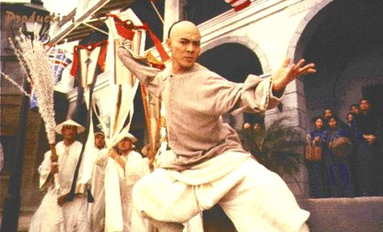 The movie stars Jet Li in the role of the legendary late 19th century patriot, healer and martial arts master Wong Fei-Hung. And the role gives him the chance to give the most dynamic performance he has ever achieved. Of course it helps that he is backed up by a stellar supporting cast in Rosamund Kwan '13th Aunt' and Yuen Biao 'Foon', and a fantastic villain in Yam Sai-Kwoon. The feeling I have each and every time I sit down to watch this film is not, 'This is one of the greatest Hong Kong movies ever made', but instead I feel, 'This is one of the Greatest movies ever made in the World'. Yes. It is that good. My reasoning for this? Well... To start, the movie follows the adventures of a LEGENDARY folk hero who has been the subject of over 100 movies. And what a hero. Wong is the embodiment of traditional Chinese values and a morally incorruptible human being. Secondly, the cast is fantastic. With Jet Li giving his movie making best. Add to this the incredible sets which are as rich in period detail as any other I can remember, bought to life in beautifully rich colours by astounding cinematography. I haven't even got to the action yet. But that's no mistake. This is one of the few action movies I have seen where, if you took every single action set-piece out of the film...you would still be left with a wonderful and interesting Movie. So to the action. I loved it. Every scene with Jet in just oozes tension. by the time the action does come you really care for these characters and so it is made all the more enjoyable to see them leap into action. This isn't to say that it isn't expertly choreographed. It is. It's just the movie is so good you just get carried away. The action could have been directed by a duck. You really wouldn't care. Lucky for us however, the fights are absolutely top notch. With just enough balance between high flying wire fu and a more grounded 'natural talent' style. It is superb! As I was saying before. I was a little disappointed the first time I watched this. 2 days before I watched 'Iron Monkey' and I guess I was expecting this to be just as action packed. 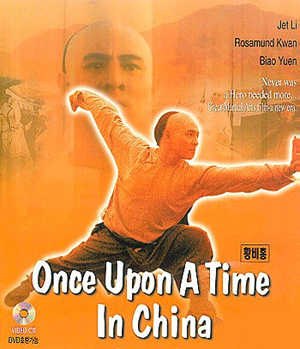 Once Upon A Time In China however is a much more interesting film with great action but also with a story that really does mean something. It has a message, and a good one at that. If we want to grow, we need to change. To let ones self change is sometimes the scariest and hardest thing for us to do. But we don't need to lose ourselves in the process. Life's all about balance. Hold on to your beliefs and culture. But take on the things you need to make yourself grow. If you don't do this. At least pick up a copy of Once Upon a Time in China. You wont be disappointed. Neo Comments: Firstly and my very first comment of the day is that well done Seraph, you just seem to improve the more you review! Soon you will overtake me! :P So fellow movie goers, well I hope you are at least if you read this, this is what I call an essential viewing, while I personally liked and even preferred OUATIC 2 better, I will not call that movie as enjoyable as it is to be the essential viewing one. The first one is definitely long at times, and in many ways is a good inaccurate history lesson, but what made this film an essential viewing is simply one key aspect - Jet Li and Tsui Hark. This is the film that made Jet Li the guy he is today, without this film, no one may even know Jet Li and no movies like Swordsman 2. Really, I should say too much as this is Seraph review, but I will finish by telling you that if there is one HK film that will introduce you to HK cinema, this is the one that I will definitely recommend. Then again Seraph is dead right here!